Technology stocks are taking a beating right now, especially the biggest companies in the market, but, despite the current news cycle, economists predict that the technology sector will continue to produce substantial growth over the long haul. Most importantly, this segment of the economy will continue to provide solid, high paying jobs. Our new graph indicates what sectors lead the list of best jobs. We gathered the data from Indeed, which analyzed two factors to determine what counts as a good job. First, the base salary must be at least $75,000, well above the national average of around $47,000. Second, the jobs must be in a high-growth sector with lots of opportunities to enter the field (e.g., astronauts and professional sports players aren’t eligible). Indeed analyzed their own numbers to see how those high-paying positions had expanded on their own site since 2014. We used this information to create a hierarchy by salary range: the highest earners are on top and the lowest are on the bottom. We then color-coded each figure to represent the historical rate of growth over the past three years. We also correlated the size of the figure with the base salary, creating an easy to understand graph of the best jobs in the U.S. today. From a visual perspective, one thing immediately stands out on our graph. The top half of the pyramid contains the most purple figures when compared to the bottom, which is mostly green. In other words, most of the highest-paying jobs have also been the fastest growing. This makes a certain amount of sense since employers seeking highly skilled workers are forced to pay a premium for their labor, especially if the number of openings exceed the numbers of qualified applicants. In other words, workers in those industries and positions clearly have the upper hand. It is also worth noting how many of the highest-paying jobs are in the technology sector. 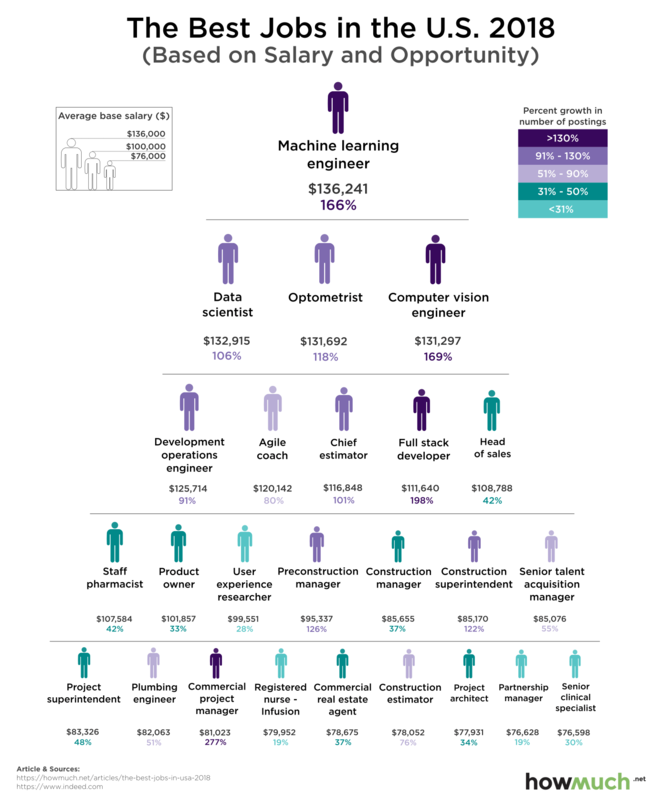 Machine learning engineers ($136,241), data scientists ($132,915), computer vision engineers ($131,297), and full stack developers ($111,640) all work on cutting edge technology. When you see a field with 6-figure average salaries and almost 200% job growth, that’s a clear indication of a technical skills gap. Compare that with the bottom of the pyramid, which is largely comprised of occupations from a variety of industries, including pharmacists, construction managers, and architects. These aren’t bad jobs, but they don’t require the same kind of rigorous high-tech education as many of the high pay/rapid growth jobs in the tech sector. The big takeaway from our analysis is that if you want a high paying job with lots of professional growth opportunities, you should definitely consider getting a degree in computer science with a specialty in engineering or data science. These positions are primed for substantial expansion in both wages and opportunity in the years ahead.